Zagorsk Pipe Plant (ZTZ) has hosted a ceremony to mark the production start of large diameter pipes for Gazprom. The event was attended by Alexey Miller (Chairman of the Gazprom Management Committee), Andrey Vorobyov, (Governor of the Moscow region), and Denis Safin (Director General of ZTZ). The plant began supplying Gazprom with its products on a commercial scale in 2016. In March 2017, Gazprom included ZTZ’s pipes in the register of pipe products approved for use at its facilities based on the quality verification provided by ZTZ. ZTZ has the capacity to manufacture 500 000 t of longitudinally welded pipes of steel grades up to X100 with a diameter of 530 - 1420 mm and a length of up to 12.2 m. Its first shipment of 1020 mm and 1420 mm pipe and three-layered insulation is planned to be delivered to Gazprom in June 2017. “Import substitution has been part of Gazprom’s systemic efforts for many years. It is a powerful impetus for the Russian industry and a crucial component of national energy security. 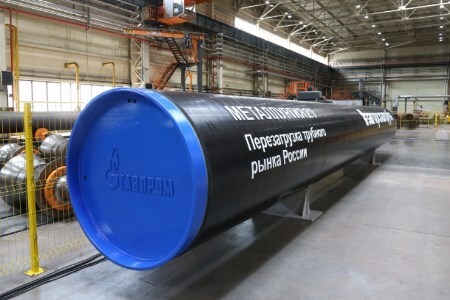 Today, Gazprom buys 95% of its materials and equipment in Russia. On top of that, the company procures all of the large diameter pipes used in building gas trunklines from Russian manufacturers. Thanks to Gazprom’s ambitious gas transmission projects, the demand for pipe products is stable now and is bound to remain strong in the future. What is important is that Russia now has a new pipe producer that meets the rigorous standards of our company. It means increased competitiveness in the pipe industry, which will lead to higher quality and greater economic appeal,” said Alexey Miller.